Have you heard that EPFO has made a new facility for their members that they can now Link Aadhar With EPF Account Using UMANG App! Here in this article, we’ll let you through step by step procedure, How you can do the process of UAN Aadhar Linking Using UMANG App. 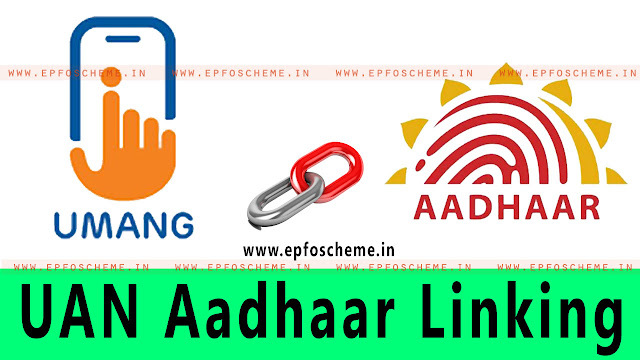 How To UAN Aadhar Linking Using UMANG App? EPFO is moving very quickly towards Digital India Mission. EPFO has also launched e-nomination facility. This facility of linking UAN with Aadhar using UMANG App can be done by downloading UMANG App on your smartphone. Every employee who has its own UAN which is activated Can avail this benefit. It is independent from the employer. If you have installed the UMANG App then you can follow the given steps down below. But, if you haven’t installed the UMANG app yet, Then you must install it first because this feature cannot be done without this app. If you are an IOS Apple User then visit the App Store and download UMANG app. So, now we’re sure that you’ve successfully downloaded the app, the next step is to follow the given steps down below. Step 1 – Firstly, Open the app and complete the Login procedure using your Login Credentials. Step 2 – When you are on the main page you’ll see many features & facilities that this app has offered. Here you have to click on the EPFO link. Step 3 – You will now re-direct to the page where you can see the services provided by the EPFO. Step 5 – You have to select the “eKYC Services” In order to link your Aadhaar with UAN. Step 6 – Now, you can easily see that there is a button named “Aadhar Seeding” on which you have to click to begun the linking process. Please Note: In order to start the linking process, you must have your UAN Activated. Step 7 – Now on a recently opened screen, Enter your Universal Account Number [UAN]. Step 8 – Once you fill your UAN an OTP will be sent to your mobile number which you have registered with your UAN. Step 9 – When the process of verification is done, The next step is to provide Aadhaar details and gender information. Finally, when the OTP verification is done, your Aadhaar will get linked to your UAN number. Do share it with others using social media buttons. Next articleEPF Claim Status – Payment Under Process?